Early season fly fishing can be a bit hit and miss and that’s certainly proved to be the case this year. After a couple of reasonable sessions on Farmoor in the Bank Masters competition I was expecting good things from Farmoor in April as the weather warmed up. I went down for a day in the first week of April when we were experiencing unseasonably warm weather. The conditions were perfect: it was warm, cloudy with a light wind and there was a massive buzzer hatch. Unfortunately, the trout were nowhere to be seen (or caught) and I blanked. Determined to beat them, I went back the following week in similar conditions but blanked again! I was a little assuaged (but not much) by the fact that few other anglers were catching. Farmoor can be tricky early season, maybe as a concrete bowl it takes a little longer to warm up than other venues. Mid-April saw Beardy Paul and I on a boat at Bewl Reservoir, testing out our new boat seats (blog post to come shortly). Again, we were expecting good things; the catch reports had been positive, the weather was warm and the wind was reasonable. However, the same thing happened again! I did manage one but that was our total for two anglers and ten hours on the water. It had, apparently, been a tough day all round with changeable wind direction the preceding week and an algal bloom putting the fish down. So, it was with hope, and a little trepidation, that found me back at Farmoor towards the end of April. Again, the conditions were good – slight breeze, overcast and warm – although we had just had a few days of cold northerly winds leading up. As I reached the water I could see fish rising, perfect! It may sound counterintuitive with fish on the top of the water but I’ve seen this before and know they can be difficult to catch, so I started with a team of buzzers and a Diawl Bach on the top dropper and started to count down. Within two casts I had my first fish, and another five followed in the first hour. They were really on the feed, taking black buzzers between two and seven feet down – I caught on the point and both droppers. I expected the action to fall off but I just kept catching, all on the same black buzzers or the black Diawl Bach. At around 2pm I caught number 19 and decided to change tactics to a bit of dry fly fun. The fish were rising sporadically, taking emerging buzzers. I had a few takes on a sugar cube buzzer but couldn’t get them to stick. 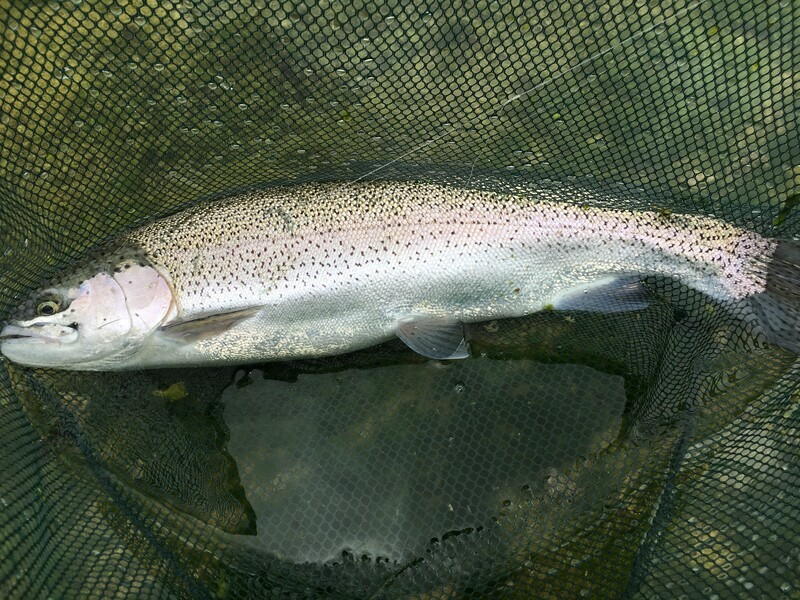 Finally, I tried a black Griffith’s Gnat and immediately nailed another two large rainbows.The trout on Farmoor 1 are absolute beasts! It a catch and release water so they are all massive, overwintered and fight like stink, often taking me down to my backing. So, 21 fish in just over six hours and by far my best days fishing, from a numbers perspective. It also cleared up a discussion Beardy Paul and I had been having – does it start to get boring if you catch lots of fish? Well, I can happily say no, it doesn’t!